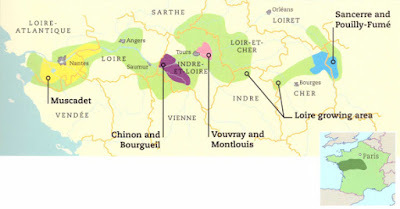 France's Loire Valley is one of the country's greatest, but least publicized wine regions. Much of that has to do with the fact that it's primarily a white wine territory, while the more famous Bordeaux, Burgundy and Rhone regions get the attention for their red wines. There are some delightful reds in the Loire, but it's the whites from here that are the superstars, namely Sancerre and Pouilly-Fumé, both produced exclusively from Sauvignon Blanc. There are other whites here that deserve your attention, one of them being Quincy. First thing you need to know it that it's not pronounced kwin-see, but rather kahn-see. Secondly, it's also 100% Sauvignon Blanc, just as with the better known Sancerre and Pouilly-Fumé. The Quincy zone is located in southern Loire, a bit southwest of Sancerre. 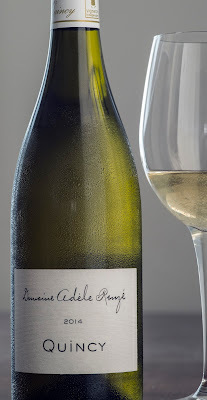 While a typical Quincy does not have the weight of a Sancerre or Pouilly-Fumé, it does have that lovely Sauvignon Blanc character - a touch of melon along with a bit of grassiness. They make for lovely wines with shellfish, chicken with rosemary or goat cheese, and best of all, they're priced less than a Sancerre or Pouilly-Fumé. Domaine Adele Rouze 2014 -Light yellow with expressive aromas of dried pear, hay and a note of hazelnut. Medium-full with excellent depth of fruit, very good acidity and impressive persistence. Excellent harmony and outstanding varietal character. Very good ripeness, but the fruit is downplayed, as there is a lovely earthiness to this wine (a note of green olive in the finish). Beautifully made and a wonderful sense of place! This would be heavenly with a trout or river fish with a sauce with olives or mushrooms. Drink now and over the next three years - perhaps longer. At an average retail price of $18 in the US, this is an excellent value. Outstanding! Briefly, two other lovely Loire Valley whites are Muscadet and Vouvray. The best examples of the former are known as Muscadet Sevre et Maine Sur Lie (sur lie, being aged on its own lees in the cellar); the wine is made from the Melon de Bourgogne grape, sometimes referred to as Muscadet. Vouvray, from central Loire, is made from the Chenin Blanc grape and can be made in numerous styles from dry to slightly sweet to dessert sweet; some examples age for a decade or more.